Beware the Chinese tour group! Comments Off on Beware the Chinese tour group! After having dim sum with Wensi (our new friend in Guangzhou) and her husband, Andy, and daughter, Sunny, we took a short flight to Guilin. 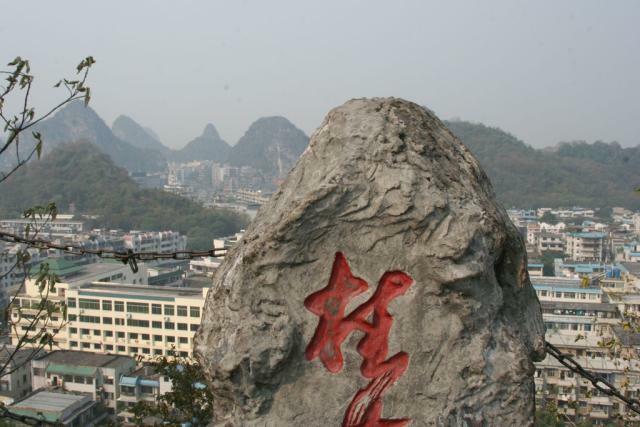 For centuries, poets and painters have celebrated the beauty of Guilin’s natural surroundings. A famous inscription in the town explains that its scenery “excels all in China.” As we drove from the airport, we soon noticed giant, cylindrical mountain peaks jutting up from the ground. These limestone “karsts” were thrust up from the sea many,many years ago and carved to their present-day configurations by centuries of erosion. 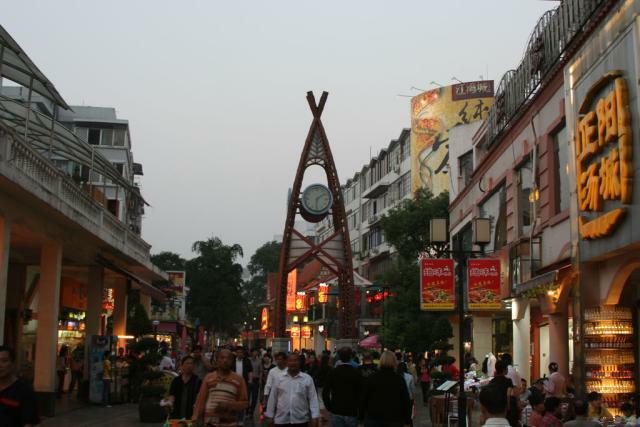 We had read several reports about the harm that had come to Guilin as it became famous. We soon found these reports to be correct. Thousands of tourists have flocked here in recent years to view the scenery. With their new-found wealth, the Chinese are touring their country in droves. Tour buses are everywhere in Guilin, and we constantly feared being trampled by a stampede of Chinese tourists wearing matching hats or shirts and following their flag-holding guide. Notwithstanding the mass tourism, there are a few sites worth visiting in Guilin. After renting a couple of bikes and slurping down a noodle soup breakfast in a local dive, we rode to Seven Star Park. The park was opened as a tourist destination around 600 AD!!! That’s right, tourists were flocking here over a thousand years before America was even founded (sort of puts things in perspective…). 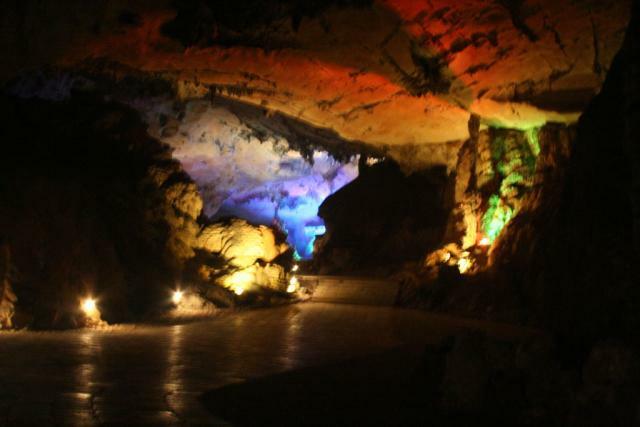 The park consists of seven peaks and includes several caves, including the gorgeous Seven Star Cave, which we had all to ourselves after we convinced the guard at the entrance to let us enter even though it was temporarily closed. We also walked open a small zoo housing two giant pandas. 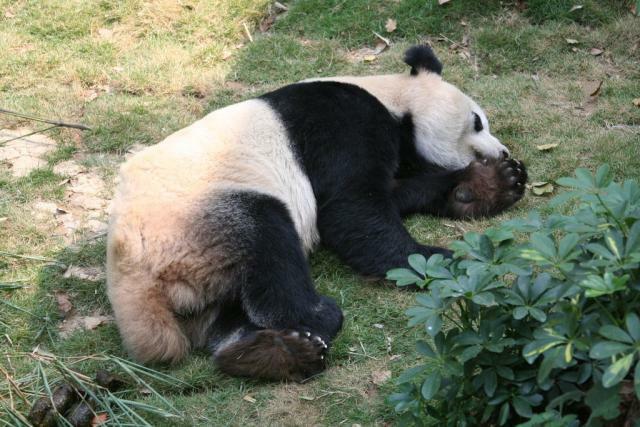 Despite some alarming heckling by a few of the visitors, the pandas were content to doze away the afternoon.